High above the hustle and bustle and exhaust fumes and traffic of the city streets are some of Budapest’s best rooftop bars, from which you can enjoy stunning views over our fair city. Below are the premier skybars to be found around town. While the roof terrace of this ever-popular party boat isn’t very high in the sky, its location – docked on the west bank of the Danube – still makes this a great spot for finding delight on summer nights. The old Ukrainian ore carrier continues to be one of Budapest’s favorite venues for kicking back and casting a serene gaze over the gently-flowing Danube and watching the changes in Pest’s glowing buildings as the sun goes down. In addition, the series of live concerts held here is unmatched among most of the city’s other venues. Would you rather explore the incredible ruin pubs of Budapest? Here’s our guide! Corvin Terrace harkens back to the days of socialist yore. Yesteryear’s specialties include side-by-side logos of Kaisers and the Statue of Liberty, staircases full of decals and graffiti of the former ‘social realist’ Corvin market and – are you ready for this? – a supermarket elevator run by a lift boy and offering spirits and beer in the lift. And then, once you’ve braved the stairs and lift, you’ll find yourself popping out onto a huge roof terrace, with a unique view of Budapest’s roofs, the city’s many neon signs, a veritable forest of huge construction cranes and the hills of Buda. Corvin Terrace is open throughout the night, all during the summer. As an accompaniment to the cocktails and draft beers and amazing views, of course, there is the wide selection of electronic music, which is one of Corvin Terrace’s primary attractions. Every Tuesday finds Irie Maffia, a refreshing example of Hungarian reggae-dance hall music, on stage. Also, many other local groups perform during g the summer months, including Naga and Beta, prominent representatives of Hungarian minimal techno. While maybe, technically, Fisherman’s Bastion, just below St. Matyas church overlooking the hills of Buda, is not really a rooftop bar, its promenades and outlooks remain a classic spot for viewing all of the central Danube area of Budapest, from Margaret Island to Gellert Hill. Fisherman’s Bastion offers a magical view of the river and the Pest skyline. From the top tower of the bastion you really can see for miles. Fisherman’s Bastion rooftop bar is the perfect place for a quiet, romantic dinner and can also be just the spot for a glass of wine or a good cigar. It’s an extremely popular venue, so get there early if you want to get a good seat. Located atop Central Budapest’s premier party venue, restaurant and bar zone, Gozsdu Sky Terrace is a great place to stop after work or a day of shopping – that is, if you can find it! You’ll have to wander through the six intersecting courtyards of Gozsdu Udvar’s arcades in District VII and look for a sign and a lift, which will transport you magically to a spacious terrace overlooking the city. 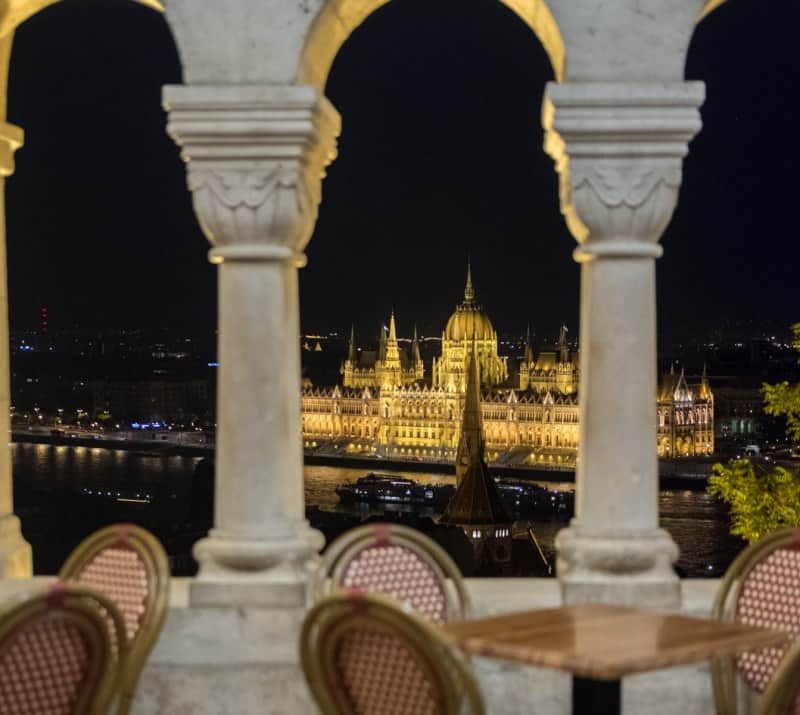 Once there, you can enjoy cocktails, wines and beer while you check out the rooftop views , including the Basilica, Gellert Hill, Budapest Castle and even the hilly skyline of Buda. During the week there are often concerts and fashion shows, while the weekends offer disco and DJs. There’s also a wide range of snacks. This popular rooftop terrace is even open year-round, with a glass dome protecting revelers in the winter months. This special rooftop deck will be opening in the late spring of 2018. The open-air panoramic terrace of the Hotel President, just off Szabadság Tér, is a tourist hotspot of Budapest. Guests can admire the breath-taking views of the city, including the neighboring Zsolnay-decorated Hungarian Treasury. In summer the terrace turns into a trendy and fashionable location, a real draw for locals and tourists alike, looking for something different. At the end of the year a winter feeling suffuses the terrace, which offers – are you ready for this? – a real, live ice skating rink on top of the hotel! The Intermezzo Ice Terrace offers all brave skaters mulled wine, roasted chestnuts, a 110-square-meter ice skating rink and an eye-catching panorama. So mark your calendar to return in December. A little caveat about this place: St. Andreas Wine and Skybar caters to a somewhat more elite – and therefore expensive – crowd. It’s not really a place to come after work for a quick pint of Dreher. It’s a sophisticated venue, serving a specific clientele, often for special occasions. This skybar, on the rooftop of the World Heritage building designed by Ignác Alpár at Váci Street 1, would make a fitting companion for its trendy cousins in New York, Sydney or London. So – the St. Andrea Wine & Skybar is definitely an exclusive hangout, where the cosmopolitan audience can enjoy the high life (literally and figuratively), accompanied by sophisticated entertainment, gourmet experiences and far-reaching vistas from atop a historic building just off Vörösmarty Square. The St. Andrea Wine & Skybar has a strictly-enforced dress code, to ensure appropriate visitors are ushered into the lift to the rooftop. At a minimum, smart-casual attire is required, so leave the flip-flops and short-shorts at home. The rooftop bar has two terraces, the Citadel Terrace and the Basilica Terrace, both offering different views and perspectives. The skybar also has an interior space, which means it can be visited all year round. The entire place is airy and elegant, and its minimalist décor doesn’t distract guests’ attention from the beautiful panorama. Special and unique cocktails are the stars of the house here, which is surprising in an establishment owned by a winery. Its bar offers a wide selection of spirits, but it’s the cocktail menu that shines here, featuring several exciting items, including signature drinks and personal creations of the Skybar’s bartenders. The bartenders are all well-known professionals who constantly train to work with the bar’s spirits and the exclusive drink selection. Maybe the best view in the entire city, the 360 Bar is a rooftop bar with a magical 360 degree view of Budapest. Plus, they offer incredible cocktails. Perched atop the elegant Parisian Department Store, 360 Bar is a cut above the rooftop bar in style and substance. There’s a wooden-decked terrace with plush lounges, smooth music and swish drinks, coupled with the wraparound views of the city that give this place its name. On weekends, the brunch is a good reason to sit back and enjoy this lofty hangout. Gary Lukatch is the internationally-unknown 🙂 author of several books dealing with his life and travels. After an undistinguished university career, and a stint in the US Army and 19 years in the financial business in the USA in 1999 he finally quit his job and moved to Hungary, where he taught English to the people of Budapest. He has been inside an Egyptian pyramid in Giza, taunted the snake charmers in Marrakech and crewed an America’s Cup racing yacht and so much more! These days he can often be found at one of several local watering holes in Budapest, Hungary, quaffing beer and singing karaoke.